Quotes that Show Nothing Is Impossible! Everyone of us has goals and dreams in life. To make it a reality and to reach there, you have to strive hard. Nothing is impossible and the belief itself will work as the driving factor to make you reach your goal. In these anything is possible quotes, you'll see that the winner is the one who pushes himself to get that goal. Self confidence will help you reach your goal. Dream high to achieve it. Things may seem impossible till it is accomplished. A disciplined person is a winner. To achieve the goal you have to work hard and devote your whole heart to it. Have belief and don't quit on yourself. Reinvent yourself for a new start. Work hard to achieve the goal. Wish and pray for it but also make real efforts. Don't set too many limits on yourself. Be a child and believe in everything. 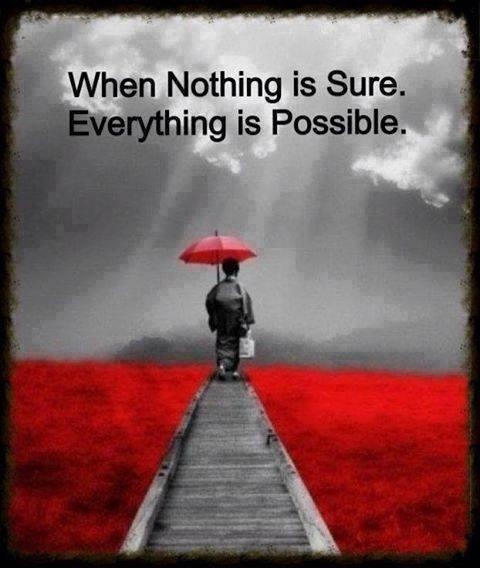 These anything is possible quotes say that your belief in making things work will be your support system in life. Delve into the positivity of things. Enjoy the confused state to create solutions. Look for the unpredictable options and the unknown premises. Anything can be changed if human nature can be. Explore yourself more to make your dreams come true. Parents instill the confidence in the children.